A canvas based approach to a customer centred and business driven service design. LSD brings structure to service design. Create better products and grow business. The set of canvases walk you through the steps needed for creating successful services & products. They help you to reach business objectives in an iterative and customer-centric way. The framework makes you fast! Based on lean principles the canvas framework walks you in a structured way through a cycle of LEARNING, BUILDING and MEASURING. The canvases guide you through the entire design process always taking in mind the customer perspective and business objectives. The Lean Service Design set of canvases is completely for free. We want as much people out there to use it in order to create valuable services & products. Lean Service Design is based on a series of canvases that walk you and your team through the service design process. They are all available as PDF for free. Just download it and start creating successful services and products. I want the canvases and I agree that my data is processed and stored. Although the set of canvases is self explaining, I gathered all our experience to provide you applicable insights in a compact and handy way. 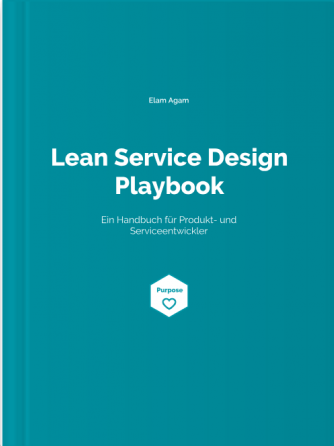 The Lean Service Design Manual (German) is now available in online bookstores. We will work on real cases to provide you the maximum of applicable takeaways. You will meet people from a variety of companies. Get what you need to teach the methodology to your organization or clients and learn ways to integrate it into your processes. Based on best practice in service design. To enable your team to create valuable services. Lean Service Design (LSD) is a systematic and adjustable way for multidisciplinary teams to create new services. It's based on our experience with hundreds of digital projects and on methods as Lean Startup, Purpose Design and Design thinking. In practice LSD consists of a set of canvases that outline the relevant phases in a successful service design process. Asking the right questions at the right time is by far the most important part of creating a product or service. Each canvas poses a series of questions appropriate for a particular phase of the process. Keep in mind, however, that there is no given order of canvases that you must obey and follow! Rather, LSD is open for modifications and should always be adjusted to the context of the project. Importantly, LSD is much more than stickies on paper. It is, first and foremost, about the mindset and practices that enable a team to create successful services. What counts at the end of the day is not whether you use this or another LSD canvas, it's about the people and their willingness to find answers to the questions of a design process in a most transparent and respectful way. LSD does not put methods in focus nor does it require deep CX/UX skills. LSD is just bringing together perspectives, ideas, goals and the people behind it, in order to create meaningful and successful services. It's not done with downloading it from the net. It's what you make of it! Every step in creating a new service is a learning point. No matter if you fail or succeed, you should learn from it. And to learn is often to go backwards and iterate. Working with the LSD canvases enables you to go back and forth. It's all there on the wall. But it's important to have clear goals that leave room for iteration. That's why LSD is asking you on quite every canvas to think about the goals you are addressing. The enemy of iteration is a detailed project plan that forces the team to worship micro-level targets. That's why it's very important to work on the right level of abstraction. Us humans are keen to create solutions and then falling in love with them because they are our babies. That’s why most service projects out there start with a solution and are reverse engineered. LSD starts with the question of purpose. Why are we doing this? Which problem do we want to solve? From there we can develop a strategy how to solve it before we start to think about a possible solution. And even if we come up with a solution, we should always consider it as assumption and verify it's value. Lean Service Design is providing you all necessary steps and question to get from the WHY to the WHAT. What is unique about LSD is that is has a social mission: to make the best practices of design & development freely accessible to everyone. That is why LSD is free to use, free to adapt, and free to grow. Any questions? Do you need support?